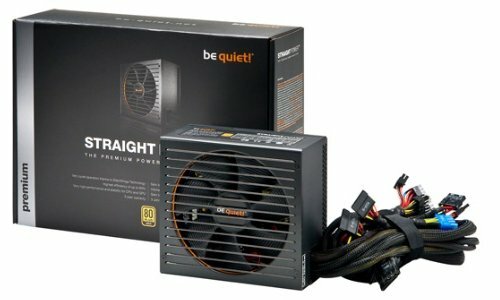 be quiet!, market leader for PC power supplies in Germany for six straight years, announced today a price drop on their most popular power supply line Straight Power E9. The predecessor has reached its end of life allowing the company to completely focus on the new E9 generation and therefore reduce the price. Meanwhile, since its release four months ago Straight Power E9 has also become a media darling with numerous awards and compliments. "Below the threshold of our anechoic chamber"
Straight Power E9 is on a good way to become be quiet! 's most successful power supply series ever. It offers consumers a unique level of performance in a power supply at popular price points and the press agrees. Straight Power E9 already received an impressive amount of over thirty awards and recommendations. "Up to half load the E9-400W was below the threshold of our anechoic chamber. But even at full load it was almost inaudible [...] (they) improved the efficiency of the E9 model in all possible scenarios. ", is just one example from Germany's most renowned technology print magazine, called C't. These results are possible thanks to the be quiet! designed 135 mm SilentWings fan which offers best in class silence and cooling. With its 80 Plus Gold certification it is also one of the most efficient PSUs in this price range, not wasting electrical power. This is achieved by using the latest topology in power supply design, called "Active Clamp + SR (Synchronous Rectifier)". It uses digital electrical components instead of older and simpler ones. So it is able to better control the power output, resulting in excellent stability and efficiency. Straight Power E9 is available with removable or fixed cables in eight different versions. The new prices now start at 67 Euro for the 400 Watt version, 77 Euro for 450 and 86 Euro for 500 Watts of power. The two most powerful versions with 600 and 700 Watts sell for 99 and 115 Euro respectively. Customers can get cable management and 480 Watt of power starting at 95 Euro. 105 Euro will buy them 580 Watt and 680 Watt costs 125 Euro. All price drops are effective today.